This interview with a former top official of Japan’s Ministry of Foreign Affairs was conducted immediately after the July 1, 2014 adoption of a Cabinet resolution that changed the government’s long-standing position that Article 9 of Japan’s Constitution prohibited the country from engaging in collective self-defense (military action in support of an ally that has come under enemy attack). The decision came just six weeks after a carefully selected advisory panel delivered a report on May 15 with a preordained conclusion—that the grounds long used to justify Japan’s individual self-defense under the Constitution also apply, within limits, to the exercise of collective self-defense. The report presented various scenarios that were intended to demonstrate the validity of the new interpretation, and during the whirlwind of spin and political positioning in the weeks that followed, the government refined those scenarios and articulated new limitations. It was clear that these theatrics were intended to downplay the historic shift that was taking place, but the performance continued, despite pushback from the media and the Japanese public. I watched Prime Minister Abe’s press conference after the Cabinet decision to allow the exercise of the right to collective self-defense, and it was a travesty. The prime minister is lying. He talked about “doing everything to ensure the safety of the Japanese people,” but the reality is the opposite. For example, in March 2004, with Spain having sent troops to Iraq as part of the “coalition of the willing” in support of the US and Britain, 191 people were killed in terrorist attacks on commuter trains in Madrid. If the Self-Defense Forces [SDF] get involved in the exercise of military force overseas, the actions of the “enemy” will put “the safety of the Japanese people” at risk. The 1.25 million Japanese who live overseas and the 20 million who travel overseas could become targets of attack. Once again at this press conference, the prime minister displayed a graphic panel that depicts a mother holding a young child, just as he had on May 15 [when he announced the report of his advisory panel recommending approval of collective self-defense]. This is an illustration for one of the scenarios that have been offered as justification for recognizing the exercise of collective self-defense: “If an American ship is attacked while it is attempting to rescue and transport home Japanese citizens who flee a military conflict overseas, the SDF cannot [under the standing interpretation of the constitution] defend that ship.” But this scenario is an outright lie. Take a look at the US Department of State’s website. In a Q & A format with the title “What the Department of State Can and Can’t Do in a Crisis,” it is clearly stated that “our priority is assisting US citizens. You should not expect to bring friends or relatives who are not US citizens…” The prime minister is using an inconceivable scenario of “Japanese citizens being protected and transported home by an American ship” as a rationale for his policy change. It has been reported that the developments leading up to the press conference were guided by the Ministry of Foreign Affairs [MFA], but as a former official there, I think that overrates the ministry (laughs). Rather than having any direction of their own, the ministry staff are merely picking up on the intentions of the US and faithfully executing what they are told to do. In other words, the exercise of the right to collective self-defense is based on the intent of the US, and the MFA is no more than a messenger. So what are the aims of the US? The problems can be traced to the time immediately after the end of the Cold War. At the time, with the collapse of the Soviet Union, the US ostensibly had an opportunity to greatly shrink its huge military. But the US chose instead to maintain its military power in order to secure its status as the world’s sole superpower. The existence of an “enemy” was indispensible to maintaining this military force, so it became established practice to always have an enemy in place, as we saw with the labeling of Iraq, Iran, and North Korea as the “Axis of Evil.” But for these three countries—as well as every other country in the world— challenging the US in war is an unthinkable act of self-destruction, so the US has taken to starting the wars. The policy of “preemptive strikes” declared in the Bush Doctrine in 2002 is nothing less than a manifestation of this. In short, the US has been lighting fires around the world, applying military force against countries and forces that stand in the way of its unipolar control. This has been the overall thrust of post-Cold War America. This led in turn to the emergence of two major problems. The first was that maintaining these war policies produced an enormous fiscal burden, so it became necessary to shift some of the load to other countries. Second, if the US acted alone in pursuing war, it would become the target of the concentrated hatred and resistance from around the world, so this exposure too had to be shared with other countries. At the top of the list of these “other countries” were Japan and Germany. 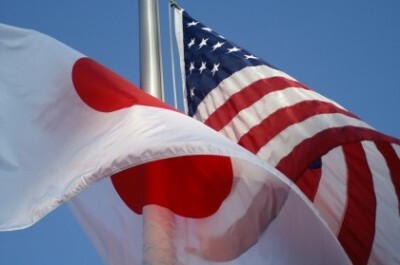 The statement declares, “Bilateral cooperation in improving the international security environment to achieve regional and global common strategic objectives has become an important element of the alliance.” In other words, the US and Japan will work together in the future to improve “the international security environment.” The recent moves around collective self-defense can be seen as the Abe administration’s overhaul of the political and legal framework in order to proceed with implementing the “Transformation and Realignment” plan. In concrete terms, this means that the SDF will be committed in the disputes and wars that the US military starts in various parts of the world. Prime Minister Fukuda Yasuo, who succeeded Abe after his first stint as prime minister ended in 2007, is known for having refused an American request to commit SDF transport units to the war in Afghanistan. However, it’s hard to imagine Prime Minister Abe rejecting such a request. Of deeper concern is what might develop if a hawkish successor, such as former secretary of state Hillary Clinton, takes over as president when Obama’s term ends in two and a half years. I have been struck by how the recent developments in Ukraine have once again exposed the nature of the US military-industrial complex. Neo-Nazis formed the core of the force that violently drove the democratically elected Ukrainian president, Viktor Yanukovych, from office; Assistant US Secretary of State Victoria Nuland provided full support to these neo-Nazis and continues to be in charge of US policy on Ukraine. Nuland is the wife of Robert Kagan, the theoretician of the ultra-right neoconservative movement in the US, and is herself a neocon. She previously served as spokesperson for the State Department, so it should be surprising to find a person like this at the core of American foreign policy. Moreover, these neocons and the military-industrial complex that backs them aim first of all for regional destabilization, as exemplified by Ukraine. This is because a region that is stable and at peace leaves little room for American political or military intervention. Of course, a framework has been constructed whereby the US avoids armed clashes with major countries like Russia and China that have nuclear weapons and can threaten the US. But when other countries fail to fall in line or otherwise displease the US, they are put down by military force or destabilized from within. It remains unclear under what circumstances the SDF will be dispatched abroad; but as long as the US maintains these war policies that sow tension throughout the world, the SDF that has until now never killed nor lost a single person in combat will someday, inevitably, face the moment when it will cross that line. At that time, what will the Japanese people do? In this fashion, the exercise of collective self-defense only means that the SDF will become mercenaries in the service of the US military, harming Japan more than it helps the country. Top officials at the Ministry of Foreign Affairs, to say nothing of Japan’s politicians, are probably fully aware of this. But following the US is a means of self-protection, and so they lie and fail to call out lies for what they are. This posture is reminiscent of Japan during the time leading up to the beginning of the Pacific War. At that time, there wasn’t a single person in the military or the government who believed Japan could fight the US and win. Nonetheless, in the interest of self-preservation, they didn’t express their opinions. They chose to give themselves over to the current of the times, and brought on catastrophe. We must not allow this mistake to be repeated. And the nation’s people must not allow themselves to be deceived once again. This is a slightly abbreviated version of an article based on an interview by Narusawa Muneo, editor of the weekly Kin’yobi, which appeared in the July 11, 2014 of the magazine. Magosaki Ukeru is the former director general of the Ministry of Foreign Affairs International Information Bureau and former professor at the National Defense Academy. His books include Nihon no Kokkyo Mondai (Japan’s Border Problems). John Junkerman is an American documentary filmmaker and Asia-Pacific Journal contributing editor living in Tokyo. His film, “Japan’s Peace Constitution” (2005), won the Kinema Jumpo and Japan PEN Club best documentary awards. It is available in North America from Icarus Films.